After leaving the Topography of Terror, Jon and I found that the sun was setting, we were starving, and a drink or two was needed to take the edge off. To the Augustiner! 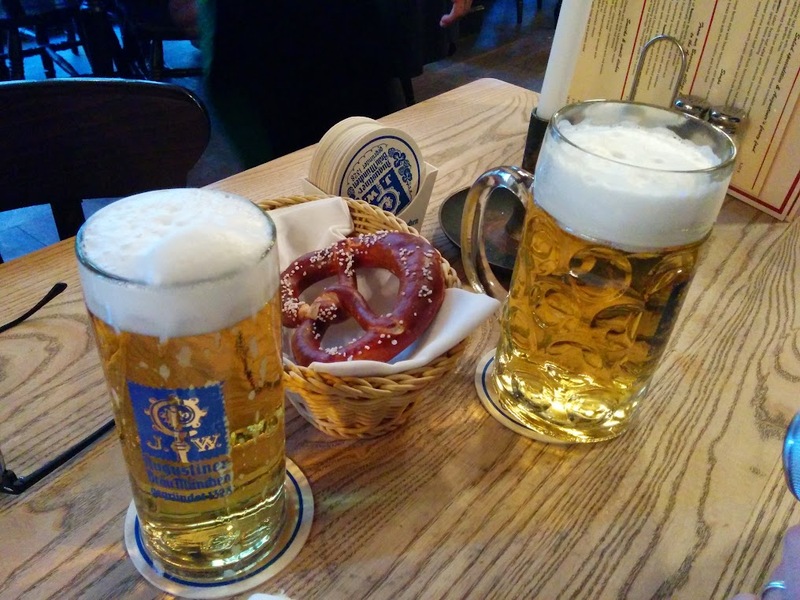 We ordered very large beers and settled in with our pretzel (why every restaurant doesn’t replace bread and oil or chips and salsa with a big ol’ soft pretzel, I just don’t know). Then we ordered-I went for traditional Bavarian sausages, Jon went for something that is easy to find in England (but that I really dislike) called currywurst, and oops, turns out it’s still gross in all its authenticity in Germany. Also turns out traditional Bavarian sausages basically come in a pot of hot sausage water sprinkled with…chives? Maybe? And special sausage tongs! Still tasty though, although not particularly appetizing in appearance. So we ate our sausages and enjoyed our very very large beers. This set the tone for the evening, which would end up going very much as it began-after ditching the bikes and cleaning up at the hotel, we headed back out for Oktoberfest shenanigans at Alexanderplatz, what used to be the main square on the Soviet side of Cold War era Berlin. It’s almost gaudy in its straightforward architecture and socialist style. I was surprised at how Oktoberfest in Berlin is pretty much exactly the same as Octoberfest in Ohio, or Hyde Park’s Winter Wonderland in London, meaning very cheesy, very fake, but super fun and happy nonetheless! And obviously with more lederhosen. We also met up with a friend of mine from Ohio, who is currently living in Berlin and just moved over a month or so ago. Small world! Hi Taylor! We didn’t spend much time at Oktoberfest before making our way to the massive beer hall that is Hofbrau Berlin, which coincidentally was also filled with drunk Germans in traditional dress, dancing and singing along to a rocking house band. Surprisingly enough, the crowd went wild for the most traditional of German songs, “Blurred Lines”. We were given seats next to two drunk guys about our age, we danced, we drank from tankards, the men taught us some German (for example, I now know that “saufa” means drink! ), and we had a lovely evening. Alas the fun couldn’t last forever. Or it could have, but we’re not that wild anymore, so after Taylor said farewell to catch her train home, Jon and I took a long walk back to the hotel, stopping to enjoy the quiet streets of Berlin by night. And bears. There are lots of bears in Berlin for some reason. Finally, a bit of Checkpoint Charlie in the moonlight. How strange to know that this space used to be the most common crossing from East to West Berlin, full of soldiers and guns and fear. Now it’s next to a McDonald’s. So it goes. Just a bit left, my friends. A final morning in Berlin, and then back into the clouds.